What makes a good tour guide? Facts? Figures? Long dreary monologues? We don't think so. In fact we are firm believers that the secret to a good guide is all in the sense of humour. We had an epiphany one day and decided the very best tour guides would in fact be stand up comedians. 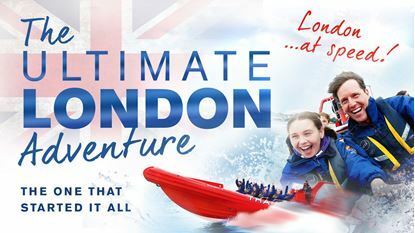 So that's exactly who we chose to talk you through your London RIB Voyages experience. Our comedians will keep you well and truly entertained with their constant supply of high-brow wit and humorous anecdotes to ensure you thoroughly enjoy your trip with us. Fresh and funky stand up comedian, hairy young at heart cheeky chappy and all round general stunt man. Often seen on the comedy circuit performing at Jongleurs, Comedy Club and Up the creek wearing a blouse and drinking a Pina Colada through a straw. Mad about fancy dress. Head Guide, makes himself at home, part of the LRV backbone. Actor by trade, show off by nature. Loves to be centre of attention, stories sometimes questionable but enjoyment never is. Pushes his luck, likes to show passengers sites other tour guides leave out. A squirrel, just as popular with the gals as the guys, cannot help but make people laugh, a natural spark and too much enthusiasm and energy for one person. Often scrubs up well, drinks beer, eats pasties. Was evacuated during the war. Leading lady when it comes to the review world, actress by trade joker by nature. A laugh a minute, always leave you smiling dry wit from Bubbles every time. Spends a lot of money on lost hats. West end Actor, the guns of London RIB Voyages, easy on the eye but also has the knowledge. Popular with the ladies, mums and grandmas, annoyingly the guys love him too. An impressive CV ...Ben Whitehead is an actor, comedian, performance and voice artist. He appeared as the voice of Mr Leaching in the Aardman Animations Oscar-winning film Wallace & Gromit and The Curse of the Were-Rabbit. Ginger Mike naturally entertains as we make our way through the city he is so fond of. Despite popular belief he does not have an actual ginger face. Mike is passionate about people, pirates and pies. A laugh a minute ginger nut, true entertainer, and a true gentleman. Ginger Mike is now famous, thanks to trip advisor, Check out his fan base yourself! Matt, the historian, the actor, the stand-up, the all round entertainer and gentleman. No stranger to hard work, touring the country, taking to the stage is second nature to this memorable talent. A classy and serious yet hugely amusing actor. He's got an accent and story for every occasion! There's nothing quite like soaring down the Thames on a speedboat, whilst seeing the sights of London. But try doing that whilst laughing. Sounds like a good cure for hiccoughs... Definitely a good day out. For more information on our guides please click here.